There’s a bit of guilt associated with releasing this information to the public because much of what’s special about the places on this list will be lost if “The Public” arrives en masse. However, I have faith that Costa Rica will always have something new and amazing to explore so get to these “secrets” while they last then check back for our next list. If you’re looking for something a little different than the “must see” tourist destinations here’s a whole new list for the platinum anniversary of the best kept secrets in Costa Rica. A couple of hours north of San José spanning the Sarapiquí river the Tirimbina Rainforest Reserve is a long time favorite and despite an occasional bus load of day trippers on the trails it remains relatively undiscovered. We’ve been coming here for years but recently they completely renovated their accommodations and we decided to spend a couple of nights. It was fantastic. We spent hours on their excellent and extensive trail and bridge system both during the day and on a night tour that started out with a pair of kinkajos feeding in the tree tops, move on to a highly endangered northern olingo (Bassaricyon gabbii) and just kept getting better. In addition to the trails and hanging bridges through the canopy (puentes colgantes) Tirimbina hosts an excellent chocolate tour (grown, making and especially tasting!) 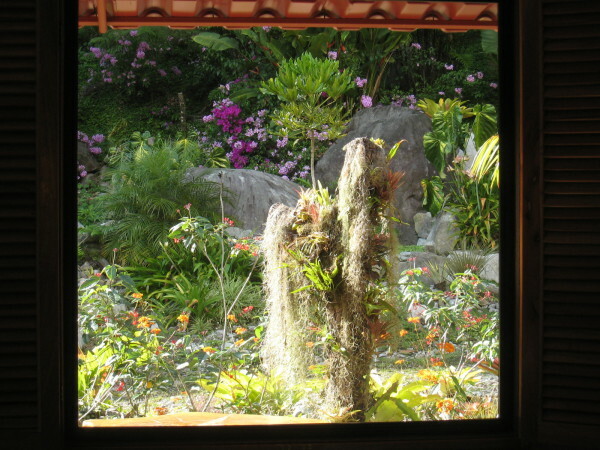 and right next door is the archaeological site and museum of the Centro Neotropico Sarapiqui. Arguably the best in situ collection of pre-Columbian artifacts in Costa Rica. Excellent incredibly well informed guides make the experience one of the best kept secrets in Costa Rica. Tirimbina could easily be substituted for Arenal into a trip plan like “More Fun Than Humanly Possible” if you want a more tranquil rainforest experience, closer access to a great rafting river (Sarapiqui) or to visit the Peace Lodge and La Paz Waterfall Gardens on your way from the airport. Except for the container port just around the point at Caldera Jacó Beach is undoubtedly the most developed and nature unfriendly stretch of the Pacific coastline. However it has a couple of ecological marvels as neighbors. The first is a surprising private forest reserve if you cross the Intercoastal highway and start walking uphill. Richard (we only know him by his first name) bought a huge chunk of the hills above Jacó years ago with the intention of developing them. After building a huge mansion he had a change of heart. We aren’t sure if Costa Rica’s wildlife worked its magic on him or he came to his senses because of the inordinate difficulties encountered when building in Costa Rica but he decided instead of building more mansions he’d start building trails. He now has one of the nicest backyards in the world. 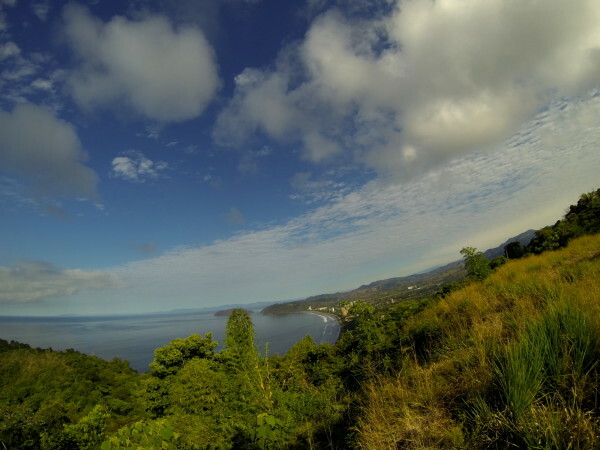 The public road from the north end of Playa Hermosa that winds up to the telecommunications towers where it connect with the public road up from the south end of Jaco cuts through the forests he decided not to sub-divide. The trails follow a little valley along the Fila Chiclera and drop to the bottom where there’s a small stream and waterfall. One minute you’re looking down on the condo towers, hotels, bars and restaurants along Jacó beach and when you go over the crest you’re looking at the forested valley leading down to the other ecological jewel in the area. 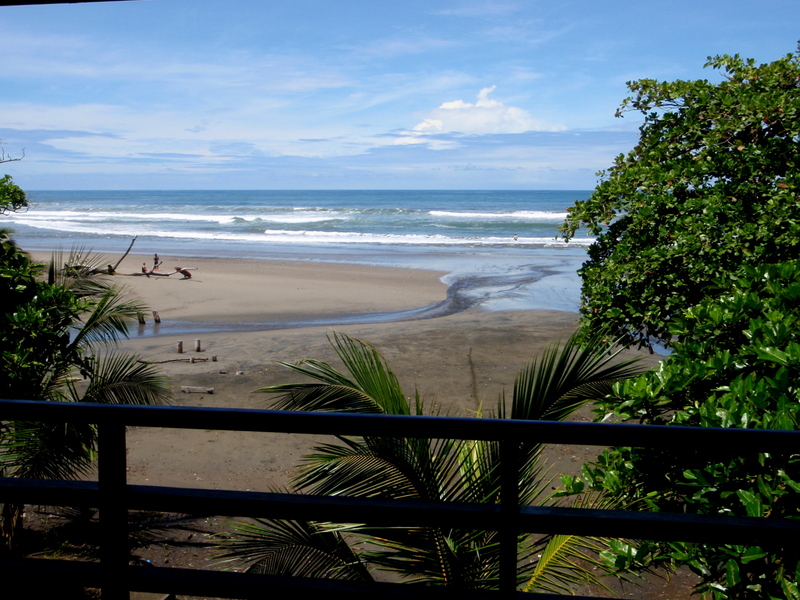 Playa Hermosa is only a couple of km from Jacó but couldn’t be more different. Except for a few small hotels and surfer bars at the far north end it’s all protected as a wildlife refuge. The turtle nesting beach is backed by small marshy areas where wading and water birds congregate by the hundreds and the estuary at the far south end is fantastic. More about the central Pacific Region. You can climb, jump off, rappel down, sleep behind, swim under or just stare in awe at them. There are a dozen of the most impressive and beautiful waterfalls in Costa Rica within a few kilometers of Dominical beach and they’re one of the best parts of one of our best trips ever – Peaks in the Clouds and Valley of the Waterfalls. 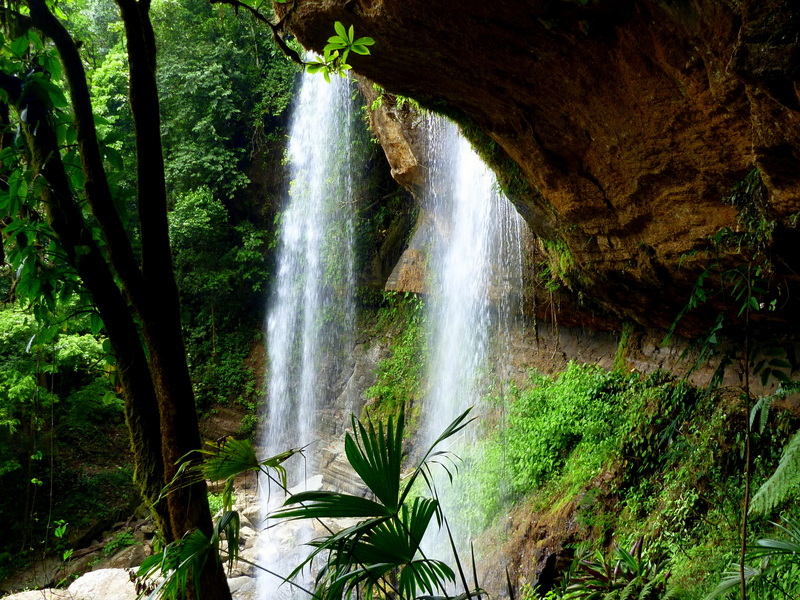 If you visit the most popular waterfall in the region Nauyaca we have one more secret to add. Even though a few dozen people come every day almost no one ventures past the falls. The trail up is through pastures and regenerating forest, but if you cross the river at the base of the lower waterfall and head a bit downstream there is a pretty good trail that goes about 1.5 km uphill through some of the best primary rain forest in the area. Everyone has a dream of a perfect tropical beach and we’ve been living that dream for a decade. There’s a house on private little beach in a cove at the end of another nearly deserted beach about half way between the north terminus of the asphalt and the southernmost paved road on the Nicoya peninsula that’s still as far as you can get from everything. This is our own personal secret and we take our friends and family to the House at Sand Dollar Cove every time we can fit it into a trip. Everyone agrees it’s been one of the best experiences of their lives. We’ve spent weeks there and it’s always simply fantastic. The longtime caretaker Cheo is friendly happy and helpful and will show you his secret fishing spots if you ask. There’s a surf wave out front albeit not a huge or reliable one but who cares when you have it all to yourself? We’re not too worried about letting the cat out of the bag on this secret since we’ve published many stories and photos over the years and it’s remoteness continues to protect it from being over-run. This can easily be added to a trip like “More Fun Than Humanly Possible” as an alternate to playa Tamarindo. It’s four bedrooms so if all of the 2 million yearly visitors to the Costa Rica Guide website read this and decide to go I suppose it’s gonna be a problem. There are more and more people visiting Drake Bay on the Osa peninsula and it’s grown into quite a little tourist town. Not as many people make it around Punta Río Claro to Playa San Josecito and the smattering of walk-in/boat-in rustic lodges and tent camps. One of the best is the remotest, furthest from Drake and closest to the park – Poor Man’s Paradise. Located on the beach a couple hundred meters from the trail head to the San Pedrillo Ranger station on the south end of Playa San Josecito it really is a piece of paradise. Caribbean style stilt houses with wooden clapboard wall that go half way up to meet wraparound screens are scattered under the shade trees just above the high tide line. Hearty tasty food and a little bar where you can relax in the rainforest in the evenings. Nothing fancy but we never wanted anything more. For the few months in the heart of the dry season when the rivers are low enough to ford and the 4WD road is passable you can arrive by SUV. Just drive to the end of the road shown on our map. Otherwise they’ll arrange a boat to pick you up in Drake. 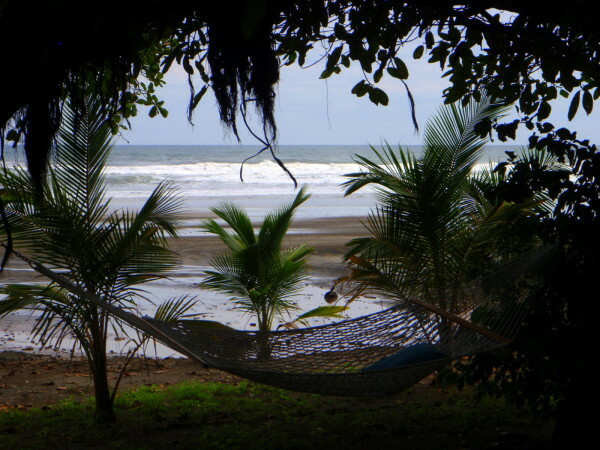 Poor Man’s Paradise or the Luxury version Copa de Arbol just up the beach would be a perfect alternate to Dominical in an trip like Peaks in Clouds & Valley of Waterfalls if you’d like to swap waterfalls for beach and wildlife. During the day there are trails and miles of beach to walk, excellent snorkeling in the cove on the north end which is protected from the surf by a reef and several small islands (gear available for guests). 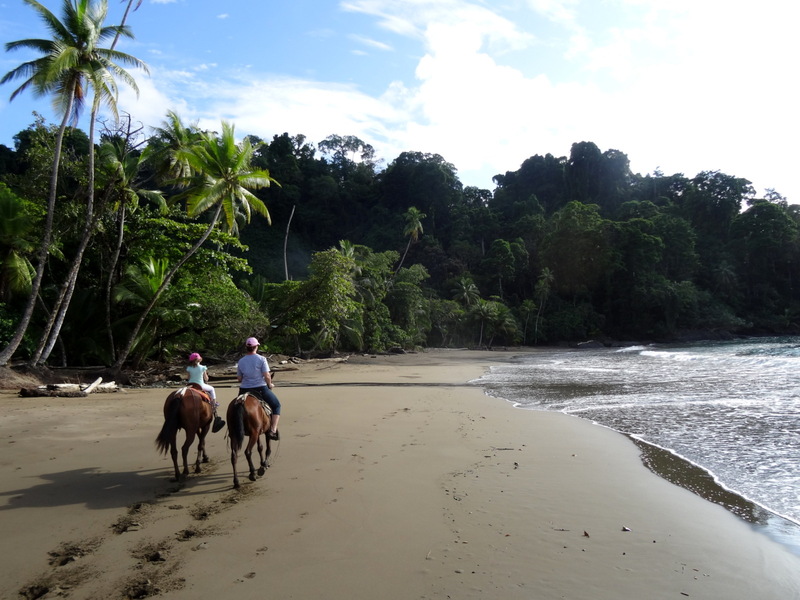 If you don’t want to walk they have horses or go a little further afield on a boat ride to Caño Island (whale watching, snorkeling and pre-Columbian artifacts) or boat down to Sirena ranger station in the heart of Corcovado national park where we finally saw a tapir after 22 years of looking. This is another place where a night tour is highly recommended. More about the Osa Penisula. It’s no secret that San Gerardo de Rivas is the gateway to climbing Chirripó – the highest peak in Costa Rica – so why are we including it in a list of best kept secrets. Because most people who aren’t interested in scaling mountains scratch it off their list never giving it another thought and most of the people who do visit are on the trail in the national park. That means if you head here to not climb the peak you’ll have one of the most fantastic destinations in Costa Rica all to yourself! Sue and I brought my parents here and had a great time. There are roughly 70 kilometers of trails through two large private reserves (Cloudbirdge and Talamanca) and lower in Chirripó park in addition to the trail to the summit. Rather than climbing the fila they wind through some of the best bird watching territory in the country and all the wildlife is easier to spot because there are so few visitors to disturb it. 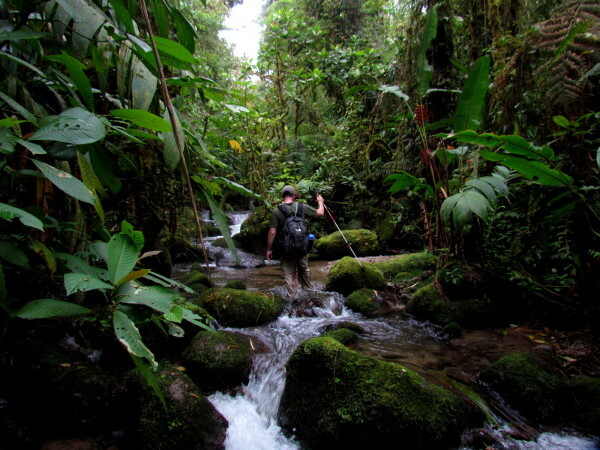 The trails lead to beautiful swimming holes and waterfalls along the Chirripó River and its tributaries, high altitude roble forest (tropical oak), and cloud forest. There’s a small hot springs about a kilometer from the two recommended accommodations listed below. What more could you want? There are a couple of great lodging options. 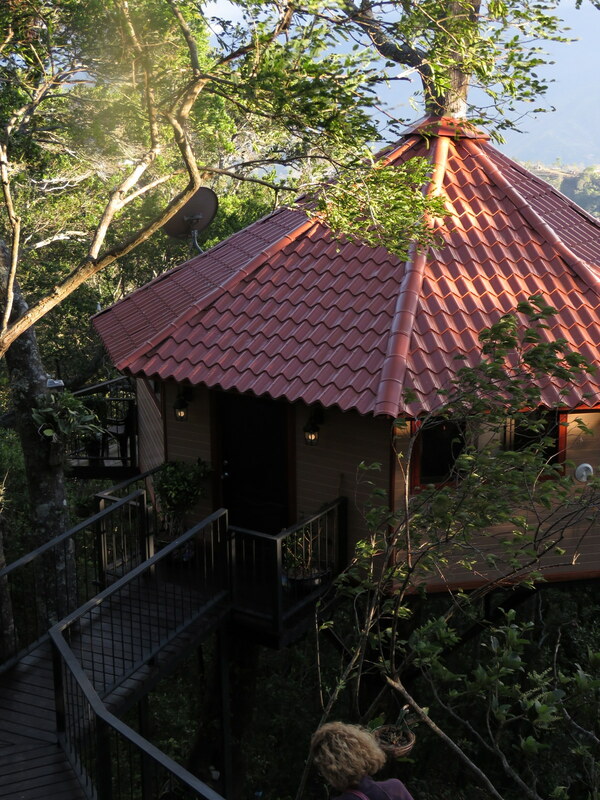 Highly recommended in the mid priced category the Talamanca Reserve has individual modern cabins and entrance to dozens of kilometers of trails through the reserve are included when you stay. Casa Mariposa is a fantastic funky and friendly option in the budget category. More about the Talamanca region. There are two popular tours of the Mangroves in Costa Rica Damas Estuary and Tempisque but there are at least a hundred more undiscovered places to experience this incredible ecosystem. Nearly any river in Costa Rica has a mangrove estuary where it empties into the ocean. Some of the best mangrove tours we’ve done (Hatillo near Dominical on the central Pacific and Javillos between Playas Coyote and San Miguel on the Nicoya Peninsula) have been with independent operators. It’s relatively cheap to buy a few sit-on-top kayaks so it’s fairly common for a guide to start their own tour business this way. It’s a safe easy and remarkably rewarding experience to glide silently through the calm shaded water spotting raccoons, sloths, tree dwelling crabs, monkeys, pizotes and hundreds and hundreds of birds. 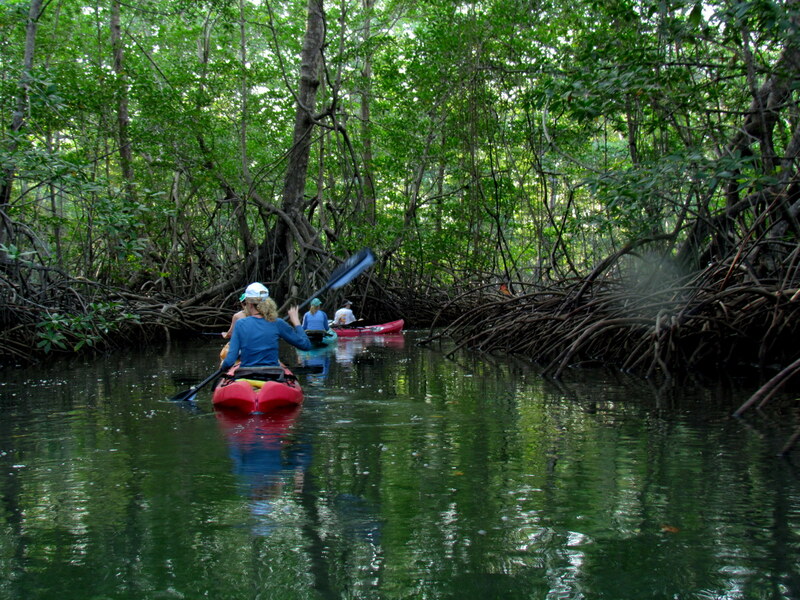 Wherever you’re headed consider adding a day on the mangroves to your itinerary. 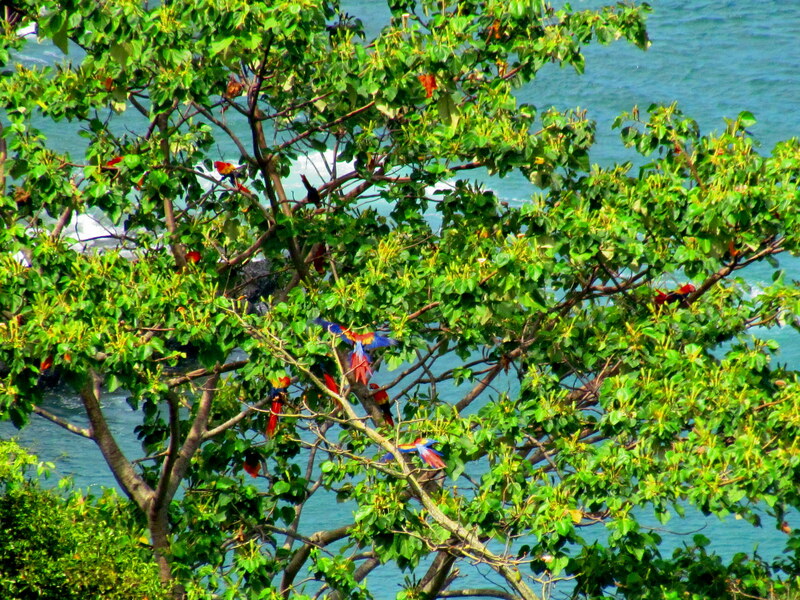 Even the ecological desert surrounding the Guanacaste Resorts has access to these little islands of nature. No one goes here and you probably won’t either. In over a week of trekking we encountered a single seventy year old indigenous man on the route across the Talamancas. It is possible to visit La Amistad without gearing up for a trans-continental trek, but it’s not easy. It takes at least two days walking to reach the park from the Carribean side, but there are rugged 4WD roads headed towards the park boundary from the Pacific side. At Volcán, Buenos Aires, Portero or San Vito you can turn north from the highway (the first two are along Hwy 2 and the second two along Route 237) and basically drive until you can’t drive any more. You’ll still be several long steep kilometers climb from the park so get an early start. Hikers and trekkers are punished by unbelievably steep and degraded trails where there is a trail at all. At the same time they are rewarded with a truly wild place that rarely sees human visitors. No one goes here and you probably won’t either. This is one secret that’s going to be kept safe for a long time by simple inaccessibility. Officially Discovered! 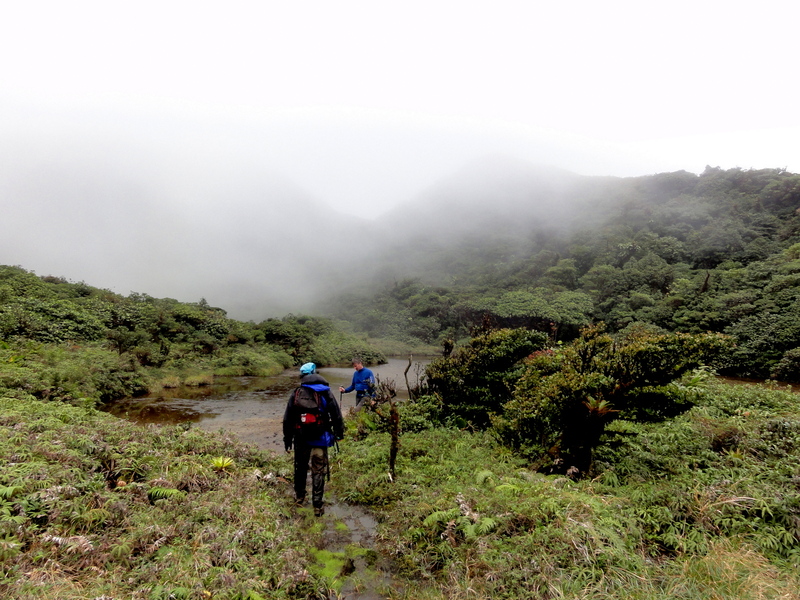 Tenorio National park is no longer a secret. The completion of the bridges over the rivers and paved road to the park entrance in 2018 allowed a massive influx of visitors inducing the park to impose a quota of 500 people at a time as of April 2019. Although that’s a huge increase from the average of 20 per day of just a couple of years ago, many are just there to spend a couple of hours at Tenorio National Park and few stick around to experience the region. Tours from the Guanacaste beach resorts (~1.5 to 2.5 hours away) or Arenal Volcano (about an hour) unload at the trail head for Celeste Waterfall and after a couple of hours on the trail and admiring the turquoise blue spectacle they load back up and leave. While the world famous waterfall is certainly worth a look and the trail in is very nice the region has much more to offer. The few lodges spread around the area are uniformly excellent (yes we’ve tried them all personally several times). From the budget family projects at Heliconias and Finca Verde (aka Finca Gavilan) to the luxury Celeste Hideaway you will not be disappointed. In the middle are Tenorio Lodge, Celeste Mountain Lodge and Sueño Celeste B&B all of which are highly recommended for their hospitality, settings and food. We keep expecting this area to explode because it has so much to offer and is strategically located near the Liberia Airport, Arenal and the Guanacaste beaches. So far it still has a distinctly quaint and uncrowded character. There’s really no secret here. 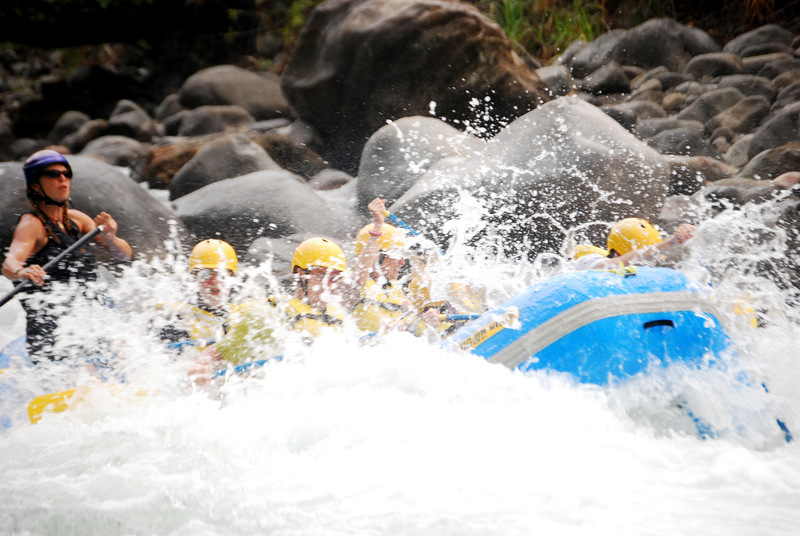 It’s long been known that this is one of the top white water rivers in the world. No one doubts that spending the night at a raft-in luxury eco-lodge (Pacuare Lodge) or its slightly more rustic neighbor (Pacuare River Lodge) deep in the rainforest along side the rapids is a once in a lifetime experience. Whichever lodge you choose luxury (Pacuare Lodge) or rustic (Pacuare River Lodge), or it it the reverse?… I’m always mixing them up but you’ll be able to tell by the prices… anyway, whichever lodge you choose the river is the same (top 10 in the world on some lists), the food fantastic and the scenery breathtaking. We’ve included it here because it may be a secret to you. Since there’s only room for a few dozen visitors at a time in the back-country accommodations and they fill up fast in the peak seasons most travel agencies concentrate on more profitable destinations where a few thousand visitors head every night. Another little secret if you’ve only rafted in the Rockies or northeast – tropical water is warm. You can forget about the wet suit and shivering and even roll out of the boat and swim alongside to cool off in the calm sections. Those and many more are described elsewhere on the site and there are a few we still haven’t told anyone about (gotta keep something back for the 25th silver anniversary edition) but I hope this list gets you started on a path to discovering some of the less visited destinations in Costa Rica. Most of the things we suggested on our first list 20 years ago are still largely unspoiled (except the natural hot springs. They hunted those down and developed the crap out of them but we have a whole new list they haven’t found yet). The developers are slowly marching north and south from highway 21 from Liberia airport so the Nicoya beaches are being built up a bit but it’s definitely slowly. Most of the growth in Costa Rican tourism over the past two or three decades has concentrated on more of the same. 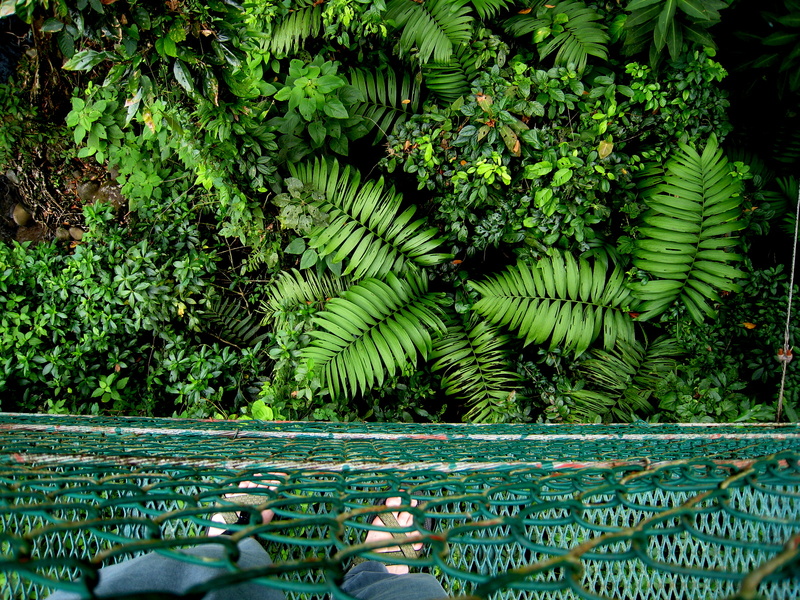 More cloud forest lodges at Monteverde, more international four star all inclusive Papagayo Guanacaste beach resorts, more waterfall rappels at Arenal volcano and more floors added to the condo high rises going up at Manuel Antonio. We’ve heard that Costa Rica is over. Overpriced, overrun, overbooked, overcrowded, overdone, overhyped but perhaps the reality is that the best of Costa Rica is continually overlooked.